~ A refraction discovery is dwarfed by its much larger data application. 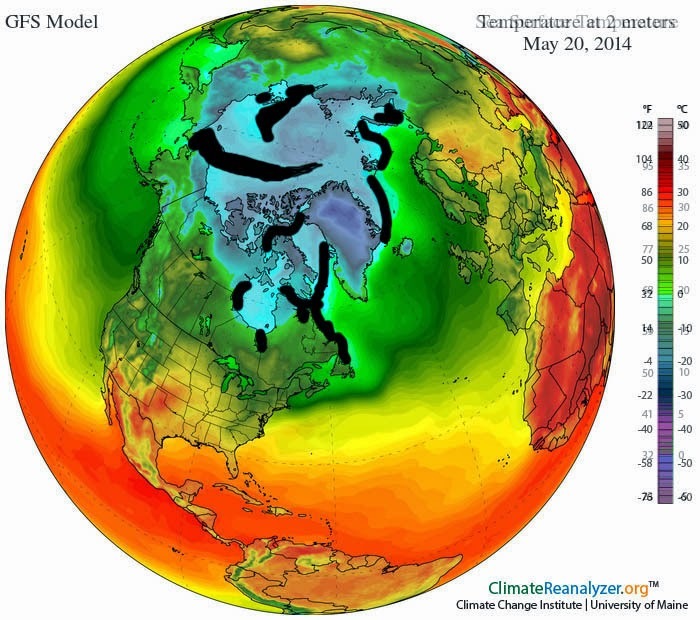 ~ Observing underside melting will help understand sea ice dynamics. From the fascinating revelation of actually observing whether the underside of sea ice is melting or not. We can can take it to a much larger scale, to the space platforms. Where the thawing action is visible whenever they display their daily average temperature results. At first glance, it may surprise some, the underside overall melts in a wide section one day, then to another area much further away the next, leaving the impression of chaos which if you go underwater at the North Pole, you would see just that, underside art of mix geometry and light, art only nature can achieve. Tw : temperature of top of sea water; Ti: top of sea ice temperature; Ta : air surface temperature. Super accretion mirages of the freshly formed sea ice, the horizon is dramatically low, because new sea ice is quite warmer than the air just above. The horizon line should be on top of the grey cloud like layer, right under is the refracted sky by an inferior mirage. Horizon Height is directly proportional to the difference in temperature between Ta and Ti. The colder Ti the higher the horizon, like the example above. 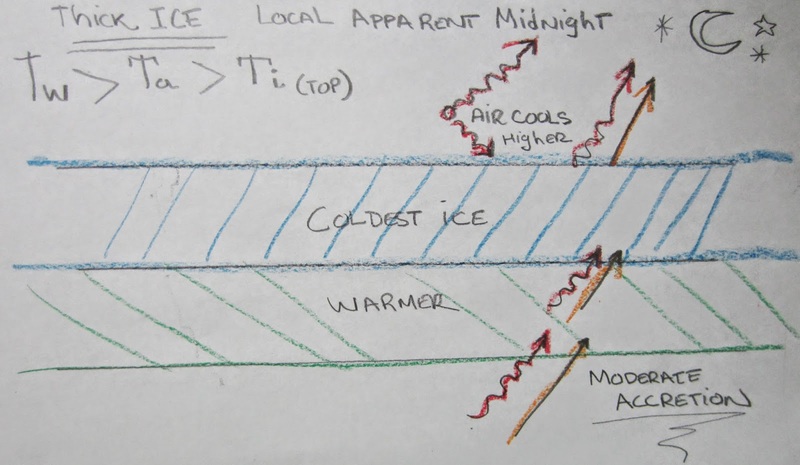 Moderate accretion happens by the shear thickness of the ice, now a large insulator, thermal flows upwards towards space are similar to the fall scenario except less heat escapes, more often than not, it is the top of the ice which is the coldest medium, the difference in temperature between very near ice air may be small with gradual warming further aloft. 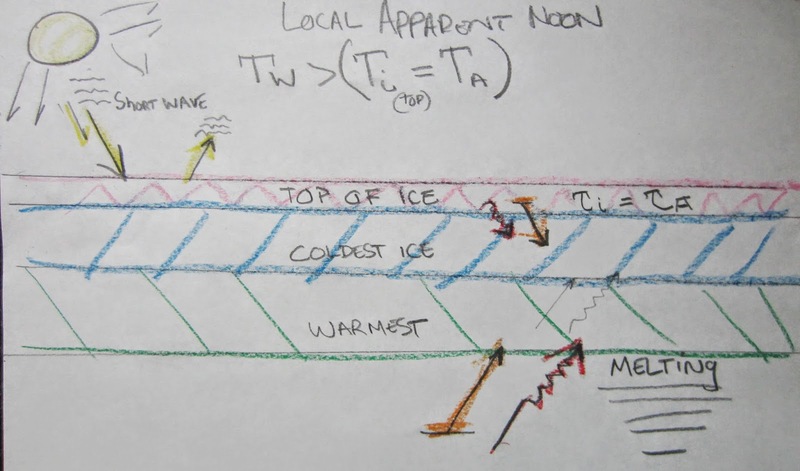 Cooling of air near the ice adds a downward thermal flux, but since air has significantly less heat capacity, the ice absorbs a fraction of this long wave heat but does not warm up much from the gain and re-emits thermal rays towards space. Unlike during Autumn, the thicker colder ice layer causes accretion. These sketches are done without the presence of clouds in mind. Thermal flows dramatically change when low overcast cloud conditions exist, when so, sea ice horizon height lowers similar to effects by the noon sun. 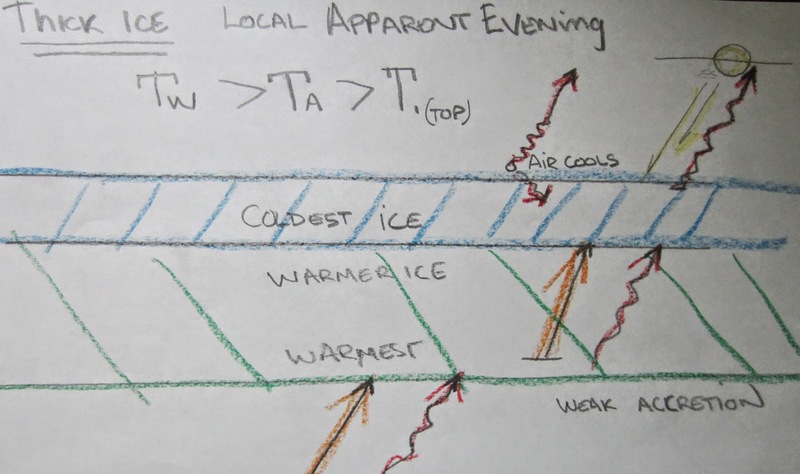 In addition to a cold on top and warm ice strata below, a thinner top of ice temperature variance zone always susceptible to weather must be common. But the net effect of the long Arctic night creates a large coldest ice layer which becomes steep in proportion to the severity of winter degree days, accordingly, spring season onwards sea ice requires significant warming before the structure of the lower Arctic Ocean atmosphere changes more permanently. 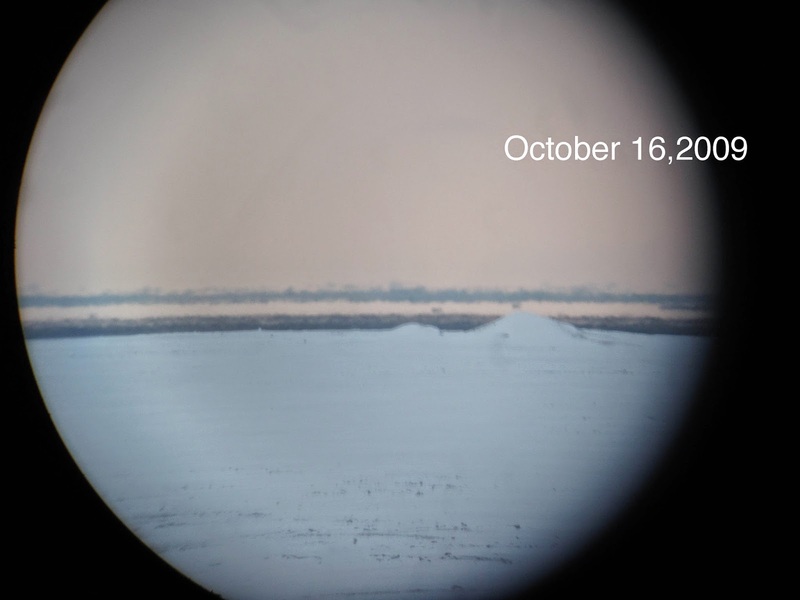 Left picture horizon was lowered from solar ray battering, layers of the near and gradually more distant horizon appear to grow on top of each other until they form an ice wall (center and right). Ice is warmest after Local Apparent Noon, coldest in the morning prior to sunrise and for a few hours after. This rising horizon simply indicated that the top of sea ice was only partially warmed, as the sun lowered, cooled fast by convection and contact conduction by the larger much colder ice layer immediately under. Surface air cooled less as rapidly, but only very near top of the ice first, then upwards in altitude. In the evening after a sun ray bath, top of ice appears to cool fastest. From a starting point of surface air and top of sea ice having the same temperature, the lowest air stratum in direct contact cools along with sea ice, causing readily visible thermal layering which becomes the famous Norse "ice wall". This "wall" becomes higher as the inversion becomes steeper at the ice surface to air interface. The inversion peak also rises in altitude, this makes "ducting", a refraction phenomenon similar to fibre optics, possible at higher above the horizon. Accretion continues in such a time of day, but much weaker, because the ice is thick and was warmed by earlier solar heating, a bottom refreeze can make this accretion unnoticeable. About 2 hours after Local Apparent Noon , April 10 2014, the horizon is at its lowest point. Top of ice warmed no more, the horizon stayed fixed, underside of ice melting has occurred for about an hour. 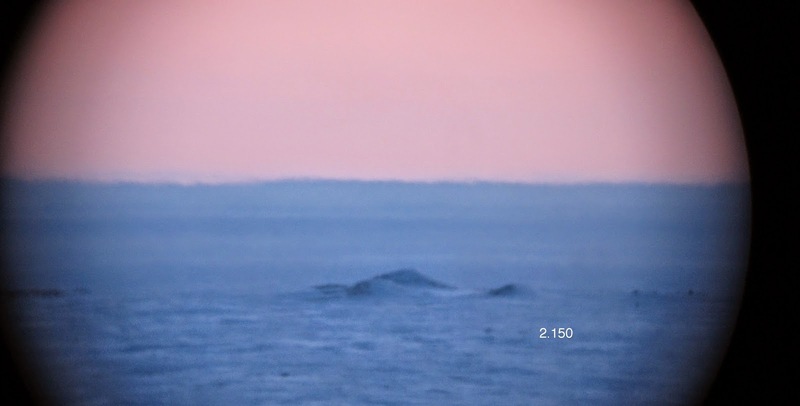 As seen from the refraction largely nullified, the ice horizon is at the same height as with open sea water in autumn when the temperatures between sea and surface air are the same. 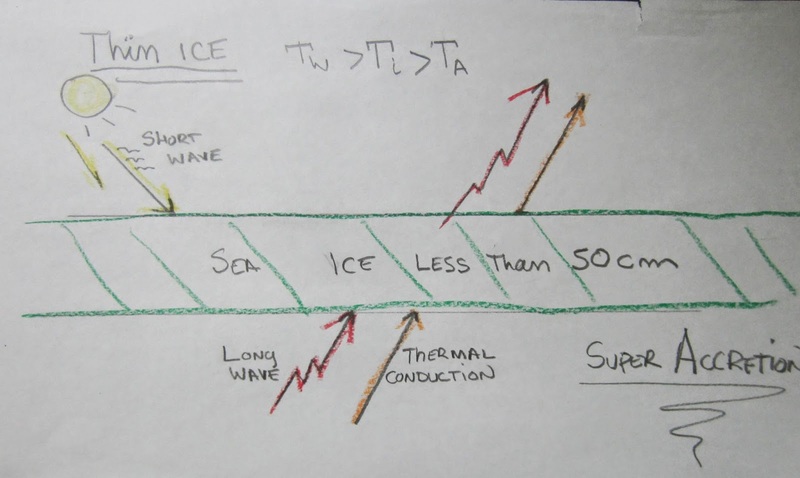 Ti = Ta means there is very little or no more loss of thermal heat from sea to space, especially since short wave heat is added to the ice by the sun warming its top layer. The coldest ice layer shrinks, more thermal heat from sea water is focused on the bottom of the ice. The underside melts until very top of sea ice becomes coldest again. The reason for the temperature stalemate is found with the latent heat of melting at bottom. Excess heat can't increase temperature because excess heat goes to melting ice. Ta >= Ti hypothetical formula for determining where thick sea ice underside melts. Applies when Ta is equal or greater than -1.8 C .
If the average surface temperature is greater or equal to the average temperature of top of sea ice, its underside melts because thermal rays no longer escape from sea towards space. 3 meter sea ice bottom also melts for the same reason. Even melting thicker sea ice just as much. According to many buoy data, the bottom of the ice column temperature is nearly the same to adjoining sea water. The process of accretion, which exists when top of sea water thermal rays escape to space, adds more ice onto the underside, but when there is no longer any heat escaping, ice bottom melting should start. A few days later and Hudson Bay underside sea ice appeared completely melting. 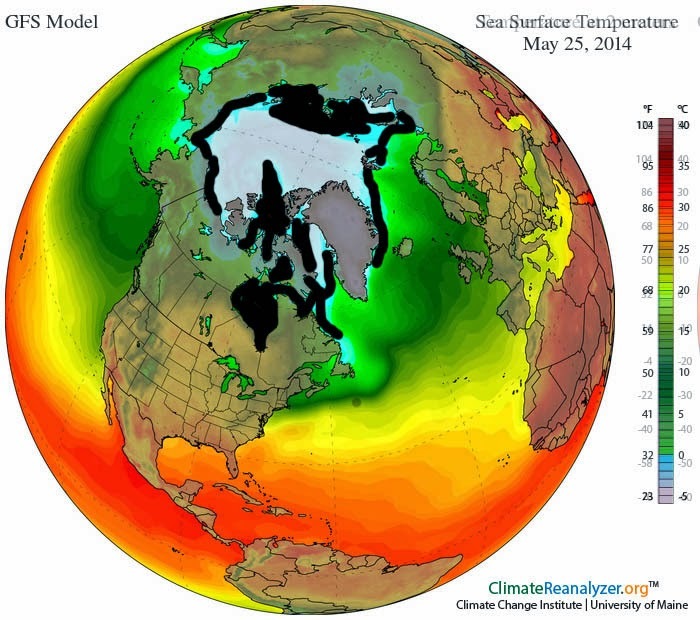 But note Central Arctic Ocean melt zones with a totally different look. This is not surprising. But a long time chart of underside melting averages may be interesting. During early Polar spring days (Ta < -1.8 C), the melting period lasts as long as Ta = Ti. After the long night sunrise, the melting period gradually increases day by longer day by solar rays increasing in power with the sun rising in altitude. Despite sea ice albedo and or reflection of rays back upwards, there is a significant enough absorption of solar rays to warm up top of sea ice to change thermal flux pattern diurnally. At lower surface temperatures than -1.8 C, the formula Ta = Ti maintains an isothermal interface, in such instances top of ice has a net positive or downward thermal flux towards the coldest layer, sea ice underside can melt even during the presence of very cold surface temperatures. (Ti > Ta has not been optically observed with thick ice with clear air ). A totally new perspective of analyzing sea ice optically has important features which become even grander when taken to a much larger scale. From all available data to date, the underside of sea ice melts when sea water thermal flux loss towards space becomes cut off by surface heat input either by the sun or by clouds. Low clouds resends lost Long Wave Radiation towards the surface, obviously this heat feedback is not as strong as high sun warming, studying the cloudy horizon has many pitfalls related to low contrast resolution. I suspect low clouds, a feature of warmer Arctic weather may contribute to much slighter bottom melting or certainly a stop of accretion, as long as surface temperatures are equal or higher than top of sea ice, in this case warmer air matters more. Arctic Ocean summer season of 2013 had more underside thawing than from the sun, extent and area was muddled by the lack of sea ice compaction by the extensive presence of cloud laden cyclones, nevertheless a significant minimum was achieved. At local apparent noon the ice horizon was 2.97' above a fixed point. 1 hour later, 3.37 minutes of arc, and so it should rise without interruption given the clear day. Not so, the horizon rose in steps, as often does on clear days, so for hour 4.5 sun rays significantly less hot can't lower the horizon. Same at hour 5 49 min. Another possible candidate of heat is the air next to ice loosing heat to the colder ice layer. But 1 joule of heat loss of air (about 1 C cooling) transposes to top of ice at about +.25 joules. While 1 cm of sea water at 1 meter square weighs 10 Kg, that is 3340 kiloJoules per meter square released upwards. There has to be such diurnal steps.